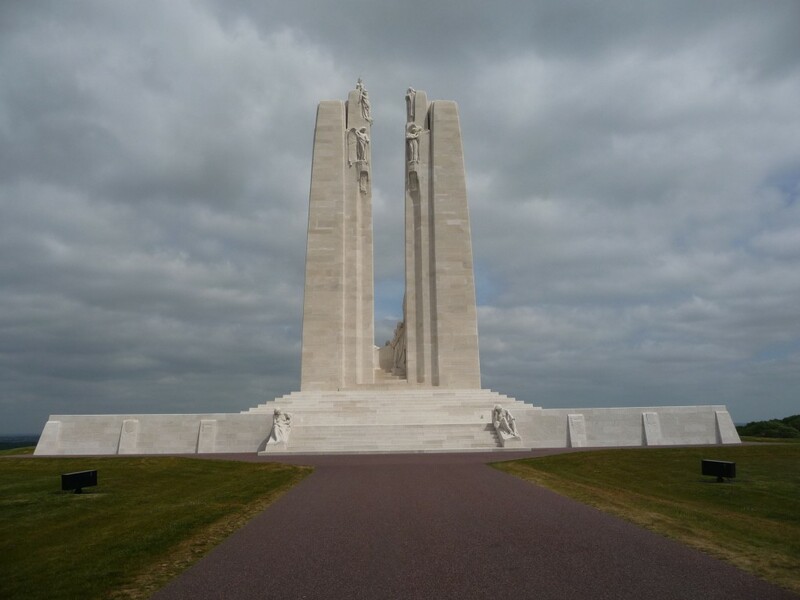 Monday morning I picked up my car at Gare du Nord and was off to Lens, which is 7 km from the Canadian memorial at Vimy Ridge. It was a nice drive (back on the right hand side!) 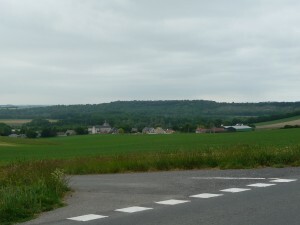 through the French countryside. What I found surprising, especially as I entered the Arras region, was how small the towns and villages still are. There doesn’t appear to have been the urban sprawl that happens elsewhere. Does everyone move to the cities? 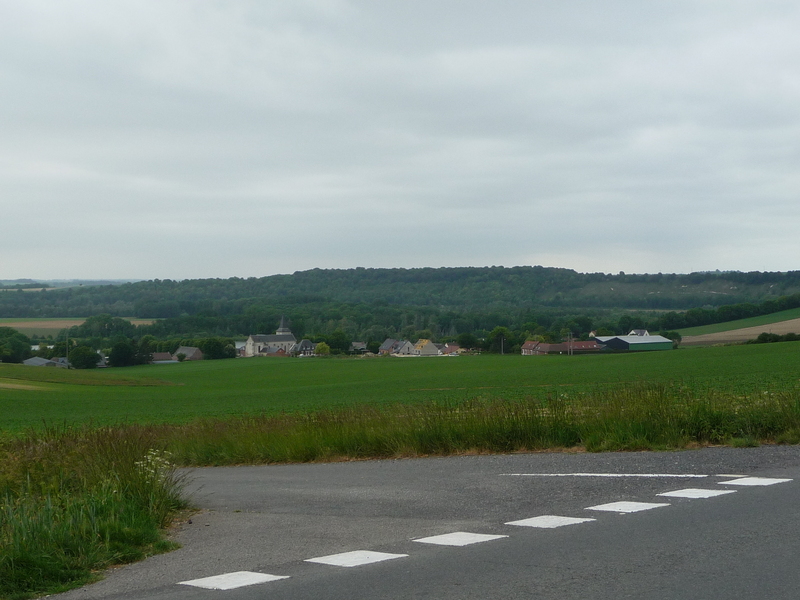 In the Arras area many of the village and town names are quite familiar to me from my WWI reading, so it was neat to be here for real, not just in my imagination. 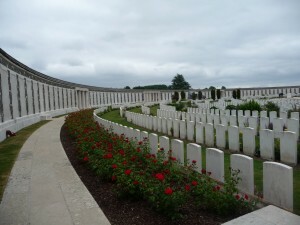 The closer I got to the former front line area, the more military cemeteries I saw. There were quite a few I passed by for Australian, British and Canadian forces. 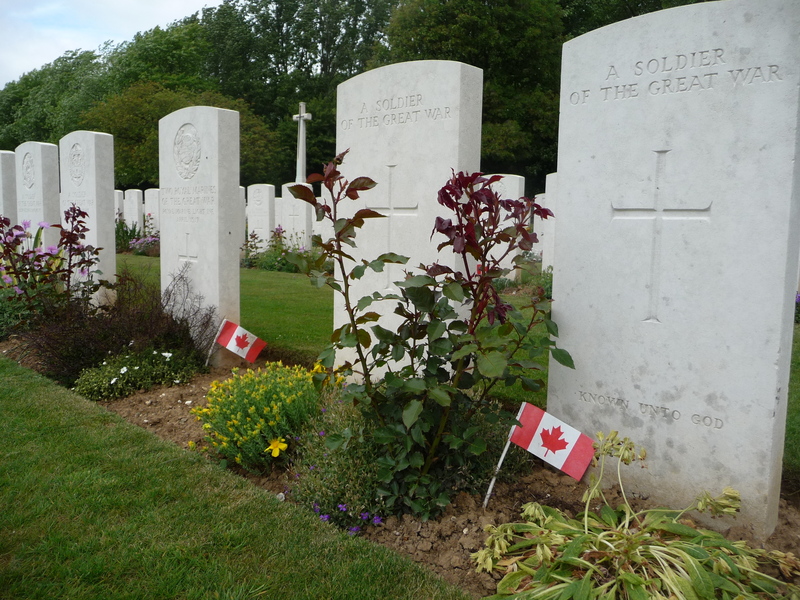 I don’t know where the French and Germans buried their dead, but the Commonwealth War Graves Commission continues to do a superb job in keeping up these cemeteries. Each Commonwealth country still pays a share of the upkeep cost based on its share of the dead. 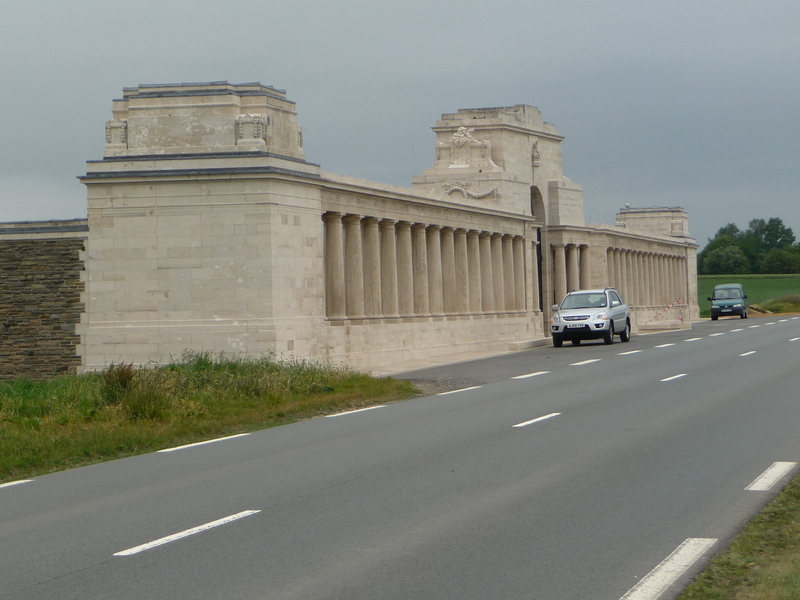 I stopped at the Pozieres Memorial, which is in immaculate condition. Hedges trimmed, flowers planted, the grass neatly cut and all the flowerbeds and lawn edged beautifully. The gravestones here are almost all for Australians who died between 1914 and 1916, but the cemetery is walled in and on the walls are the names of British soldiers who died in action but who have no grave. My great-uncle George Pellowe is among them. 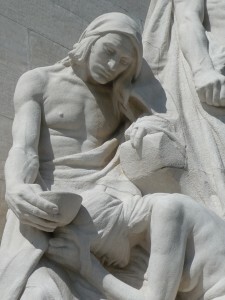 This monument was in many cemeteries, if not all. My grandfather came from a family of four boys. 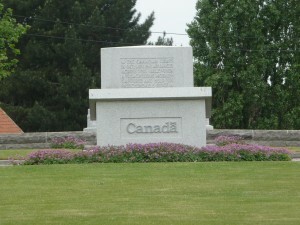 He and his brother Harold came to Canada in 1912. They had learned to ride as members of the Hertfordshire Yeomanry in England, and they went west to become cowboys on a farm in Bashaw, Alberta. They were both gunners in the 7th Siege Battery in the Canadian Corps. 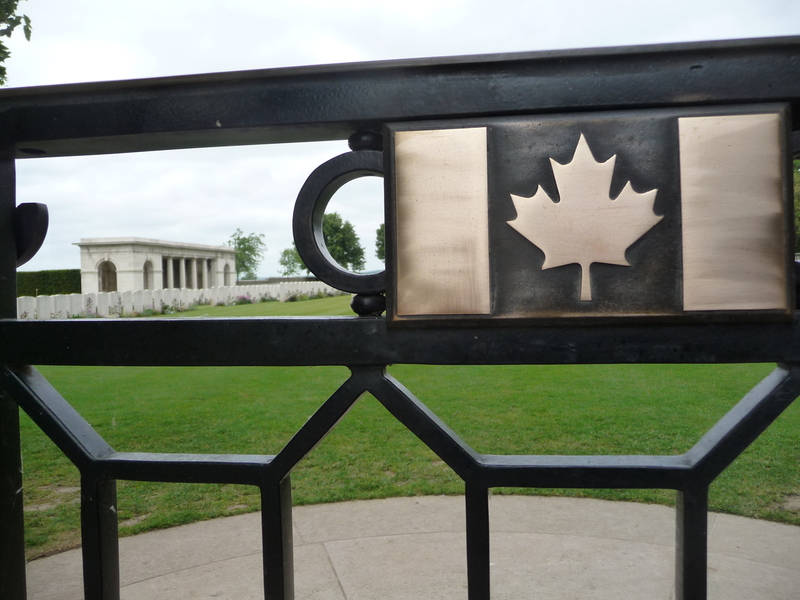 Another brother was a sniper in the British Army in WWI and moved to Canada after the war. In WWII he enlisted again but this time with the Canadians, and even 20 odd years later was still the best marksmen in his training class. The fourth, and youngest, brother was George. He was a gunner in C Battery, 4th Brigade, Royal Horse Artillery of the British Army. 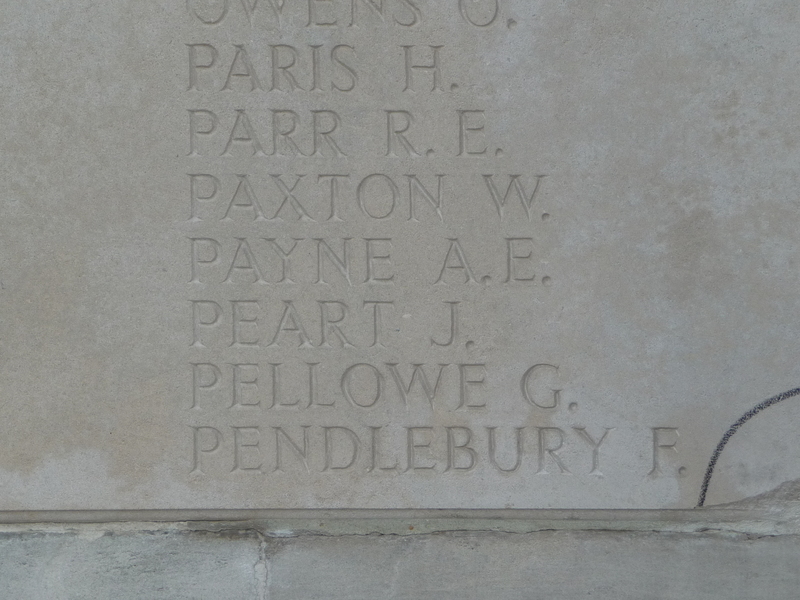 He is the only one of the four Pellowe boys who didn’t come home, which is remarkable considering that all four served at the front. George was delivering a message on April 4, 1918 when he took a direct hit from an artillery shell, which is why he has no grave. With three Pellowe men moving to Canada, you’d think there would be more Pellowes here, but there aren’t. Only two had children, and only my grandfather had a son (just one, my dad). Dad had four boys (and a girl) but I am the only one of his sons to have a son, and I only have one. So Harley, the pressure is on! Genesis 1:28 and all that. 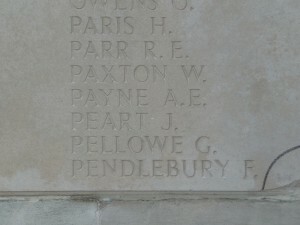 The result of all this is that it is extremely rare to see my surname anywhere, and for that reason it was quite a moment when I found Pellowe, G. carved in the stone of the wall. Canadian war graves in France. I was really touched as I looked at the gravestones by how much care was taken to respect and humanize the dead. 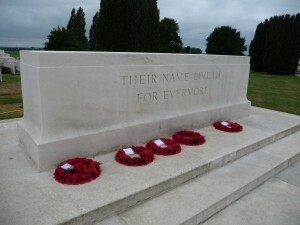 Quite a few have a person’s name, death date and unit, but a lot say “A soldier of the Great War – Known only unto God”. But where they had other information they put in what they could. For example, “An Australian soldier…” or “A private…”. They tried to honour the memory of each individual man as best they could. And they continue to do so today through the upkeep of these cemeteries. Some are quite small and are off in the middle of a field, but they are all a tribute to those who fought for freedom. The highlight for me, of course, was visiting Vimy Ridge. Every time I give my Vimy Ridge speech I am asked by someone, “Have you been there?” and the answer is “No.” Two years ago a veteran was wearing his medals, and gave me a pin (not a medal) off his jacket saying I had earned it with the speech. 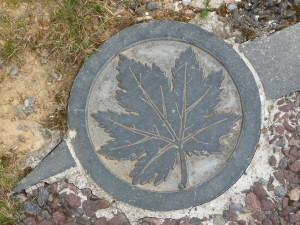 The pin is a model of the Vimy Ridge Monument. I said I couldn’t take it, but he said he could easily get a replacement and insisted I take it. Since it is not a medal, I can wear it on the right side of my general’s uniform, which the Department of National Defense has given me permission to wear while giving the speech. Did you know it is a federal crime to wear any part of a Canadian military uniform, even if it is obsolete as mine is, if you are not on active service? Retired Lt.-Gen. Maisonneuve told me even he had to get permission to wear his old uniform to attend one of my speeches! 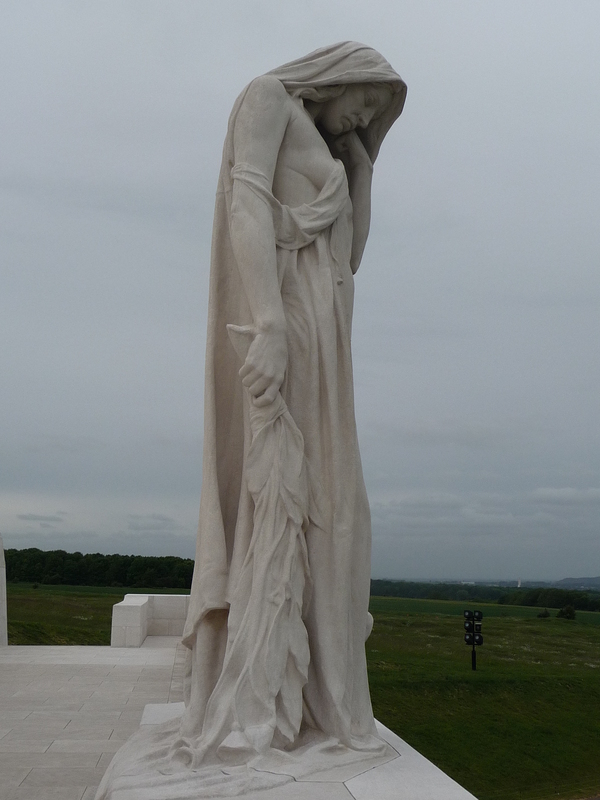 Anyway, now I can say I’ve been to Vimy Ridge. I spent the later part of Monday afternoon and all day Tuesday at the memorial. 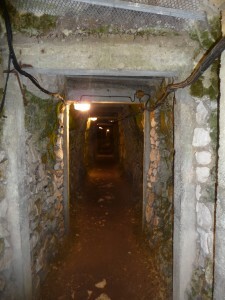 I toured the trenches and a tunnel that still exist. Wow, the tunnels were 8 metres below ground. I hadn’t thought about how deep that is. It’s deep! 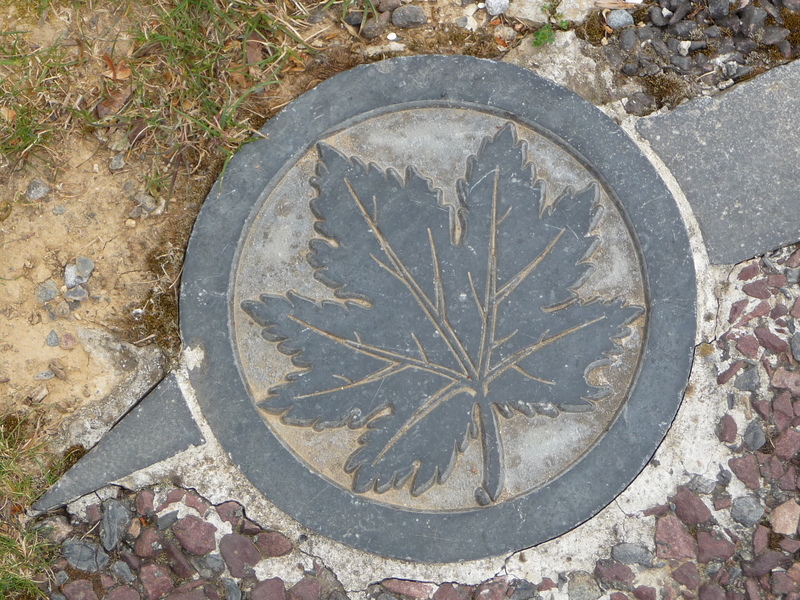 The remaining Canadian and German trenches are so close together you could toss a grenade over to the opposite trench without much effort at all. 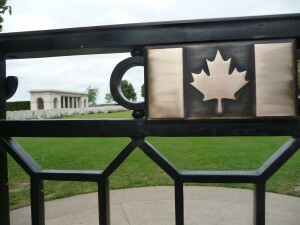 Canadian tunnel at Vimy Ridge. My goal in coming was to replace the photos of the monument that I use in my speech with pictures of my own. I wanted a moody, overcast day for some pictures and a bright sunny day for others, and I got both! Thank you, God! I had to wait sometimes for a half hour or so to get the pictures I wanted without people in them. As I saw people crawling all over the monument and wanted them gone so I could take my picture, I thought of the movie Star Trek: The Motion Picture, where the alien probe has made contact with the Voyager probe that was sent out from Earth in 1977. It thinks the carbon-based life forms on the Enterprise (that would be us humans) are infestations of the ship. Well, I thought the humans at the monument were, in a way, infestations too. “Get off so I can take my picture!” I thought, but being polite, I said nothing and calmly bided my time. That’s something else I’ve enjoyed on this trip. I do have a schedule, but at the same time, I’m not rushed and I’ve had plenty of times where I could spend longer than I intended somewhere, or I could endure a long line without getting antsy. This is a much more peaceful way to live. Relax! By the way, in Lens at least, restaurants don’t open for dinner until 7:00 pm. 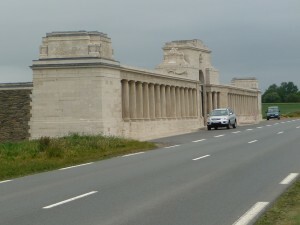 Today, Wednesday, I drove up into Belgium to visit some WWI sites. 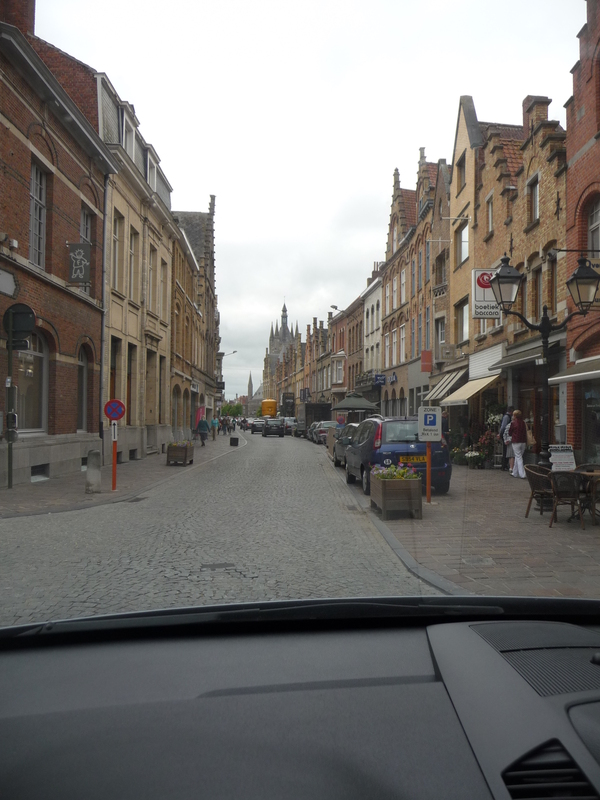 I went first to the beautiful town of Ypres, which today is spelled Iepers. Actually, none of the towns is spelled the same as they were a century ago, so using my GPS took a lot of ingenuity as I tried to recall what else was close by. In the end, I did get to everywhere I wanted to be. 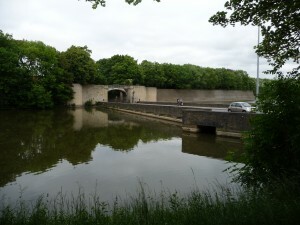 Ypres is a gorgeous town complete with walls, gates, a moat and cobblestone streets. I went to a museum called In Flanders Fields, which was pretty good, except the poem didn’t show up anywhere at all. When you enter, you use a computer to indicate your language and gender and it spits out a card that you use at three stations to follow the story of a real person who is your gender and speaks your language. My person was from England and he disappeared without a trace within a night or two of reaching the front. He had volunteered to deliver a message. Messengers only lasted about five days on the job, and they were always volunteers and there was never a shortage of them. I visited Tyne Cot Cemetery, the largest of the Commonwealth cemeteries and looked at quite a few graves. The visitor centre had a quote of Churchill’s from a letter he wrote to his wife during WWI in which he asks the question, “I wonder if all the armies went on strike, would we find a better way?” or something like that. He knew from his own experience in the Boer War how awful war really is. The youngest soldier I came across was nineteen and the oldest was thirty-eight. What a tragedy war is. 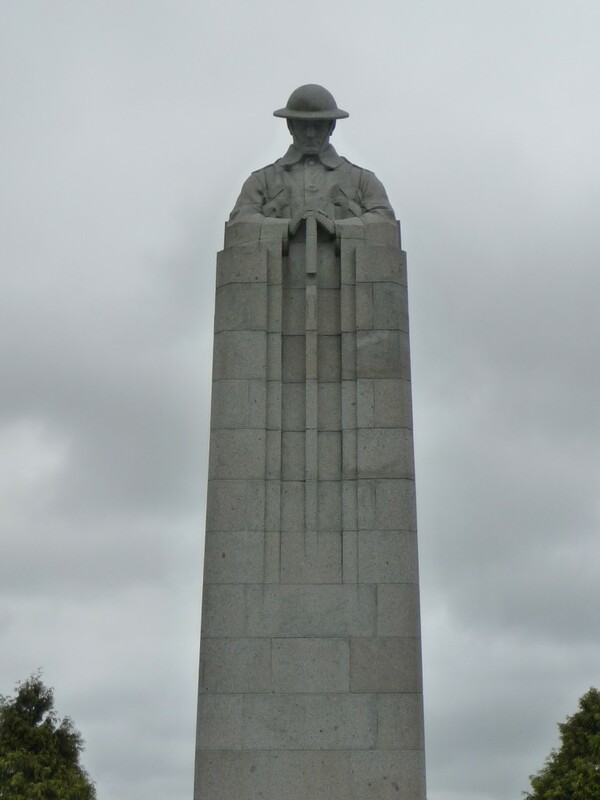 Canadian monument to the Battle of Passchendaele. For some reason I thought the Canadian Passchendaele memorial was a big deal. It was the main reason for going to Belgium, but it turned out to be just a small parkette that has a big stone with a plaque on it. Aahh, but it was a nice drive and I got to see a lot of other things I wouldn’t otherwise have seen. One of those was a very well done recreation of the underground world of warfare. You enter the ‘dugout’ from the second floor of a building and climb down into the basement. Very realistic. The Brooding Soldier at St. Julien. 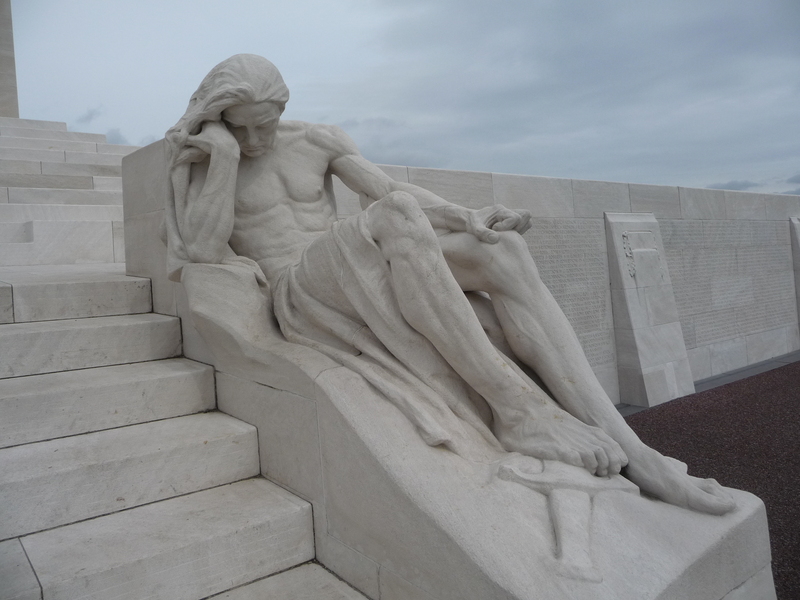 Finally, the jewel from today was the Canadian memorial at St. Julien, the Brooding Soldier. 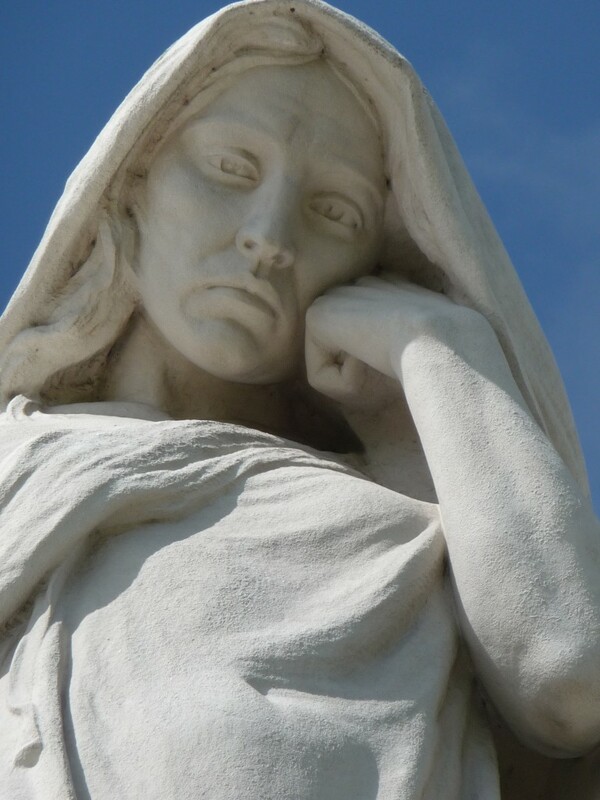 This beautiful sculpture needs no commentary as it speaks volumes on behalf of the soldiers, just as the statue of the mourning woman at Vimy Ridge speaks so eloquently for the families left at home. The two are really a pair. Tomorrow morning I’m off to Zurich to attend the annual ICFO meeting. I’m anticipating a nice scenic country drive. It’s eight hours from here, and I expect to do it in ten at a leisurely pace with some stops.